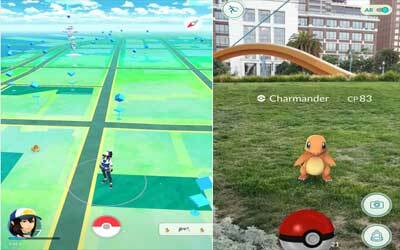 Previous version Pokemon GO 0.85.1 apk for Android will help you to downgrade or install older app easily. This is one of the best Adventure apps. Selection of monsters from the first generation of Pokémon (or also known as the Kanto Pokédex Pokémon) I think this is a very appropriate choice because most of them are so very popular. As Ingress AR game which was also developed by Niantic Labs, Pokémon GO invites players to actively move and explore the environment around them in order to hunt a variety of Pokémon that exist out there. Every monster you find also randomized in a number of locations, so sometimes unpredictable occurrence. This game provides the option Nearby Pokémon to see what kind of monster that is around you. When you encounter a monster, this game provides a sort of mini-game throwing Pokeball which utilizes the interaction of AR camera. How to play pokemon go is quite easy, you can catch pokemon, all you have to do is hold your finger on Pokeball to determine the strength and hurl toward the Pokémon. If successful, these monsters will be listed in your Pokédex and you can sell it through Transfer feature (to get items Evolution Candy), make it strong with level up, or turn it into a new kind of Pokémon (evolution). The thrill of Pokémon GO game really feels when the character began to enter the five levels. Here you can choose the three teams representing faction with different color: yellow for the Instinct, blue for teams Mystic, and red as the team Valor. All three had been representing the PvP game mechanics, in an effort to fight Pokémon Gym locations scattered throughout the country. Mastering a Pokémon Gym is the only way to get Pokécoins IAP currency, which is used to purchase a variety of items ranging from Pokémon inviter, bundle pokeball, upgrade bag, machine incubator, and others. The gameplay is amazing, it’s so much fun to actually explore your neighborhood while looking for Pokemon! As a huge fan of this franchise, this is pure awesomeness. Super fun and addictive.